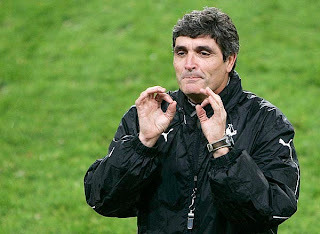 As all managers Juande Ramos has his pros and cons, here are a few of each to try and help you make up your mind if he is the right man for the job or if Real Madrid should yet again search for a new manager. Juande has managed to make Real Madrid the only team in primera who hasn't lost a game 2009. He took over at the club when it was 9 points away from Barça. After losing in the Camp Nou Real Madrid was 12 points away, since then the team has managed to claw its way within 4 points of Barça and is now only 6 points away. Real Madrid has managed to close the gap between Barça thanks to a phenomenal run of 10 straight wins. One of Juande`s great achievement's was making the team defensively strong again. Real Madrid has only let in 12 goals since Juande arrived between Liga and Champions League games. One of the things that Juande receives most criticism for is that the team fails to play to the football the fans want. Since his arrival Juande has managed the club against 4 big teams; against Barcelona, Atletico Madrid and the two matches against Liverpool in the Champions League. All of which the team has failed to win. He has given the team certain consistency but some of his substitution's are questionable such as limiting Van Der Vaart's playing time and playing with 2 defensive minded players midfielders. Also that he made some questionable tactical changes such as playing with Lass as a right back against Atletico. The main reason why Juande was bought in was for his experience in Europe. The club had high expectations for the Champions League yet the team was unable to beat Liverpool over two legs. I'd still give Juande a summer to get in the reinforcements he wants. keep in mind that it was Juande who initially alerted us to L. Diarra and diarra has been the find of the season so far. that means the man does have an eye for talent. If he gets a summer to get in the reinforcements he wants and a pre-season to hone his team to tackle the season ahead, I'm quite sure he'll do wonders. I'd like him to stay on.